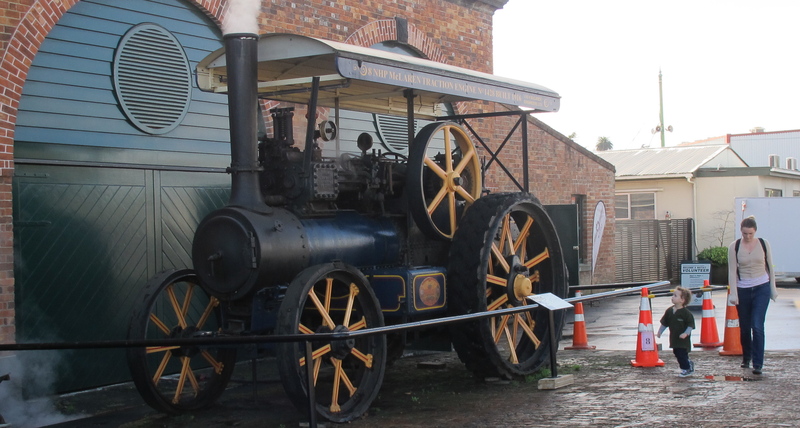 Celebrating the Volunteer Awareness week ( 17 – 23 June), the Museum of Transport and Technology (MOTAT) at Western Springs, Auckland is offering free entry. The promotion is to enable Aucklanders and tourists to admire the work of the 300 plus volunteers who maintain the huge collection of technology that helped build and run what I would describe as historical “infrastructure”. ‘Huge’ is appropriate here to describe the steam engines, locomotives, trams and aircraft restored by volunteers. The machinery is awesomely HUGE. Given the many large pieces of machinery on display, one could expect volunteers in a technology museum to all be wearing overalls, boots and look suitably work stained from taking spanners and welders to unweildy early world machines. The image often captured by tourist photographers is of a mechanic, blacksmith or the tram driver at their trade. (continued after the slide show). Yes, These are who we see demonstrating machines at work. The front men. But behind the scenes there are administrators, photographers, curators, teachers, tour guides and historians. My mid week visit found school children being herded in groups through exhibit halls by anxious teachers. Rooms of children throwing on period costumes, getting in the mood for a story time of yesterdays. In the telecommunications hall, the game of dialing a second phone then racing to pick up before it rang. The music of excited children’s babble as they tested themselves against the displays in the Challenge Zone. Contrasting, the quiet of the Aviation Hall, a tram ride away. Like People, every exhibit has a story.